Will Cloud Software Drive Salesforce’s Growth In 2018? 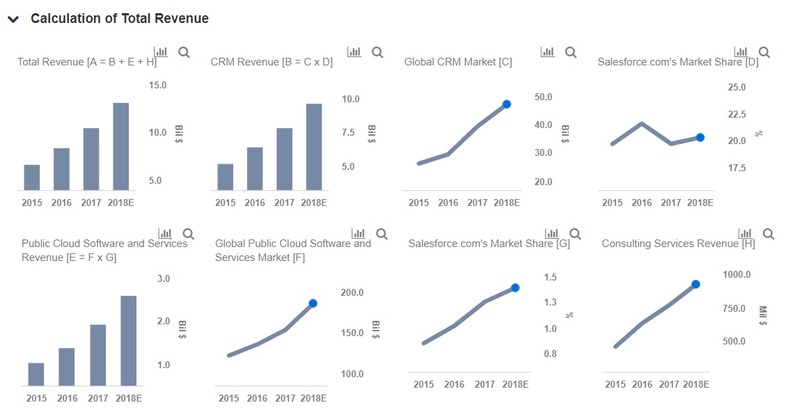 Will CRM Continue To Push Salesforce.com’s Growth for Q4? How Much Could Salesforce’s Valuation Multiples Expand? How Will SAP’s Expansion In The CRM Space Impact Its Value In The Near Term? Is The Market Pricing Salesforce Fairly? We have broken down overall revenue of the company into 3 major segments and projected expected revenue for the fiscal year 2018 (ended January 2019) at $13.13 billion. We have created an interactive dashboard What Are Salesforce.com’s Key Growth Drivers? including the drivers of the revenue. You can modify our assumptions to see the impact your changes have on the overall expected revenue of the firm. Salesforce.com is expected to continue its strong growth and the company expects, as it announced during the Q3 results, to become the fastest enterprise software company in history to reach $16 billion in revenue by fiscal year 2019 (ended January 2020). The CRM segment of the company contributes the most to the revenue growth and is expected to record approximately $9.61 billion, which is approximately 73% of total expected revenue of the company. The Public Cloud software and services division, while expected to grow strongly at about 35% YOY and posting about $2.6 billion in revenues, is contributing approximately 20% to the Total revenue of the company, while Consulting Services will contribute about $0.92 billion in revenues. In the near-term, the CRM segment is expected to continue to take Salesforce.com to new heights, while the other two divisions continue to grow at a good pace.